When dealing with jewelry boxes, attention to detail is key. This is why C R Hill is the place to go for your box and packaging needs. We have large variety of choices and work with you to find the right option. Whether you are looking for a high end Rosewood Box or a decorative Cotton Box, we have a large selection for you to choose from. Choose from various colors and sizes. Crystal style, acrylic boxes with black velvet insert. Deluxe leatherette double door style with gold trim. Soft flocked velour finish with brass clasp and corners. Classic leatherette box with gold trim. 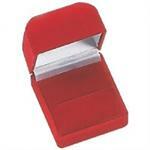 Leatherette box with rounded corners. Black velvet jewelry boxes with gold-tone rim.